The village of Vlkolínec, which is a part of the town of Ružomberok lies 718 meters above sea level, in Western Carpathian Mountains. Sidorovo hill rises above the village. 55 houses can be found in the village but only 18 of them are inhabited by 29 people at present. The village of Vlolínec was added to the List of the World’s Heritage of UNESCO in 1993 as a unique architectural complex. 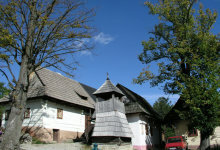 The traditional architecture of mountain and foothill region on the north of middle Slovakia is present on a large part of 797 hectares of the village. Most of the 73 protected buildings are traditional log houses and farmhouses.